Me at home in the 1970s. The lovely, enormous, oak tree was to the right of this photo. I’ve long had a love of trees – ever since I could reach up and sit on the swing under a huge oak tree we had in our front garden. I would soar up into its branches singing, “I’m on top of the world” by the Carpenters. Ah memories! When Guy and I moved to Canada we bought a house with a lone apple tree in the back garden which provided much-appreciated shade in the summer and a dramatic measure of the depth of the snow in the winter. We attached a little yellow bucket-seat swing later on, for the children to swing on. When it was time to move back to England, I realised it was that apple tree that was the most difficult part of our home to say goodbye to. Two years later we landed here in Nailsworth and now the tradition continues. 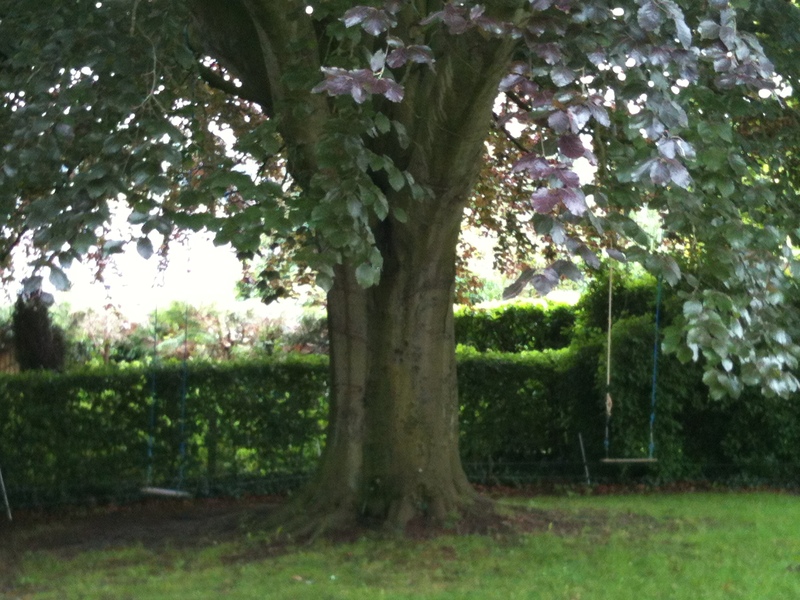 At the bottom of our garden towers an enormous copper beech tree – so huge, it’s almost intimidating. But not to Julia, who has inherited my love of communing with something larger than herself through the simple pleasure of tree and swing. She is 13 now and still spends hours out there, lost in her own world, sheltered by the power and beauty of this magnificent expression of spririt. .There’s a lot we can learn from trees.